When Should you Draft Andrew Luck? After watching Andrew Luck last night I feel he is an 'elite' quarterback. Is late 1st round or early 2nd too early to draft Andrew Luck? Thanks for writing in. Andrew Luck looked pretty good yesterday but taking him in the 1st or 2nd round in standard leagues would definitely be a reach. The only way you should be drafting Luck that high is if you are playing in a dynasty keeper league. I get the feeling this is a bit of the Cam Newton effect taking hold and I must advise against falling prey to the fad. The only quarterbacks that should be taken in the first two rounds should be; Aaron Rodgers, Tom Brady, Drew Brees, Cam Newton and Matthew Stafford – probably in that order too. 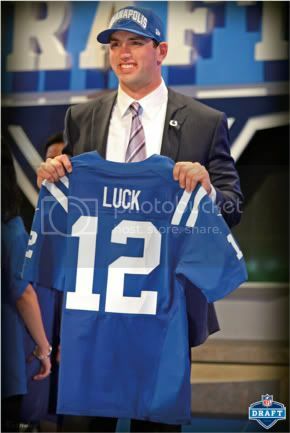 Despite the hype, I think you will be able to land Andrew Luck somewhere around the tenth round. Hope this Helps! Write in anytime for unlimited Fantasy Football Draft Advice!